As you know, our little (6’4″) bro got married this summer. The bride is from another state, so they hosted a reception there. (It was fabulous, by the way). But we needed a party in Cali. “Project Wedding” (I just made that up cuz it sounds like “Project Runway”) was a total blast for us. who are trying to make their mom proud, because we know she would have made it beautiful! *The vibe we were going for: Backyard casual, yet still classy enough to look wedding-ish. *The delegating went like this: I’ll do the food and serving things, and Kass, you do everything else. I had a vision of lots of cake stands. I love pedestal cake stands. I wish I had 500 in different shapes and sizes. But sometimes I get a vision and do a little research. With a little bit of trial and error, my handy husband makes it appear before my eyes. I totally assisted… I’m not afraid of sawdust. I am a little afraid of the nail-gun though. Here’s how we made 9 of these things, on the cheap. I knew I wanted lots of different foods out, in small quantities (so as not to spoil on a hot August night). I thought that my dinner and salad plates, that I already had, would be a great size to serve with. So we made the stands to be a little bigger than the bottom of the plates. We ended up making 2 different heights for each plate size. So here’s the four different ones. The tops were made out of the smoothest plywood I could find, that was thin enough to work with the trim. I found the trim at Michael’s. I think it’s meant for dollhouses, but now it is meant for me. Home Depot only had a few basic trims to choose from in this thin size. I searched high and low for some kind of candlestick or dowel, or anything that could give these things height. Then I found these table legs at Home Depot-the perfect solution! The completely genius thing was that they have a screw built in one end! This side screwed directly into the base. 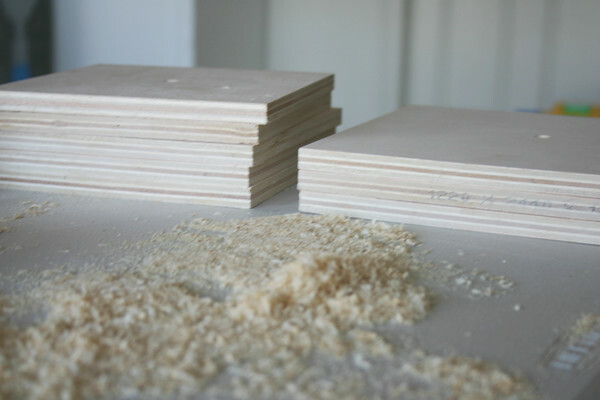 The bases were made out of 1″ pine (plywood doesn’t work very well with a router), cut into squares. We used a 3/16 ogee router bit to do the edges. 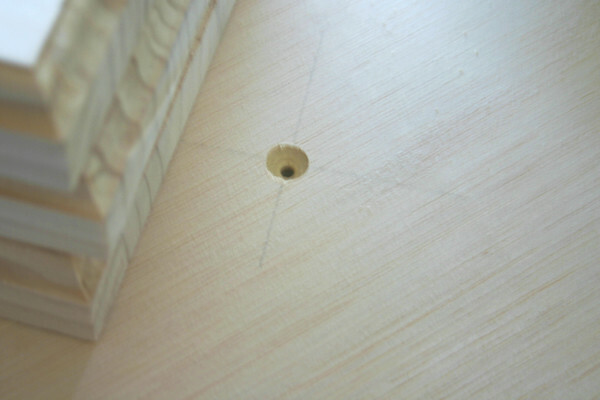 On the tops, we found the center, then used a countersink bit for the hole. Then we attached the top to the stand with a 1.5 inch screw. 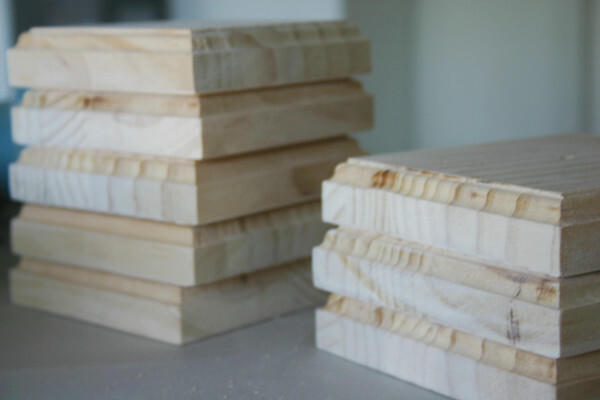 We cut the scalloped moulding at 45’s with the miter saw. Then we attached the trim with wood glue and a pin-nailer. Then I filled the nail holes and sanded away. I decided not to fill and sand the top hole. I realized if I left it this way, I could unscrew these and store them so much easier. Plus, the tops would be covered by the plates. It worked out really well to serve the food quickly, by exchanging a full plate for an almost empty one. This way, we didn’t have to bring the whole stand inside to refill it. red for Christmas and Valentines. Pastels at Easter…. yeah, you’re gonna see these things again. Stay tuned for more “Project Wedding.” We’re gonna get right on top of the blog this week! Great project! I really like the color and square shape, great job! Love it! 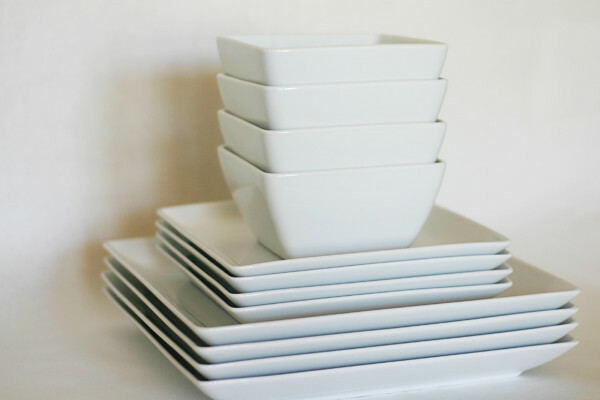 The color, the trim, and the square plates. I'm sure your brother and sister-in-law appreciated all the hard work. Note to my husband: I need a router. My birthday IS coming up, you know. Those are amazing!! Thanks for sharing them!! The color is fantastic too. I'm SO impressed! These are beautiful–and so creative. We just did an open house for our daughter and served your "caprese ka-bobs" as one of our foods. They were a big hit! OH my goodness!! Those are one of the cutest things I have ever seen!! Nice! I love your blog, everything is very cute! You are very, very talented! Wow. 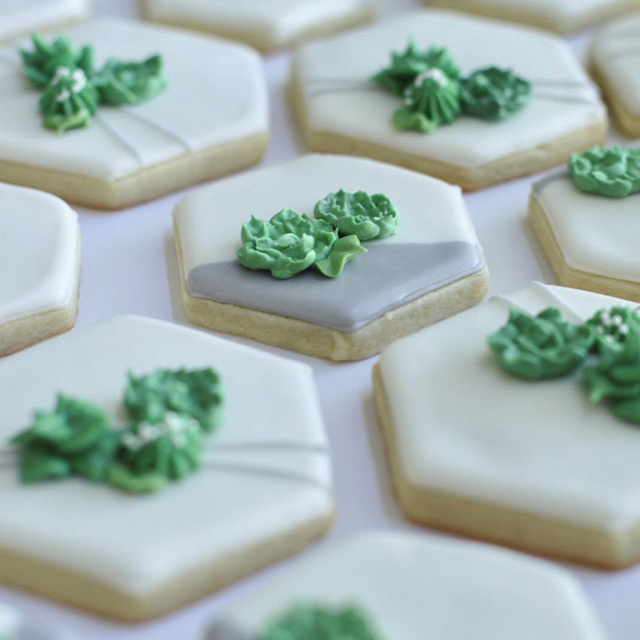 I am stunned at how simple this is and how gorgeous they turned out! I am adding this to my list of crafts that I must make. I am absolutely LOVING this and think my husband is going to have a project on his hands. Fabulous job. Flipping GORGEOUS! Wonderfully and cleverly done. I could see giving these as gifts, too. After I make some for myself, of course. Gorgeous!! Such a fun idea!! You have become quite the carpenter! I am very impressed! Keep up the good work! Can't wait to see what you will do with these stands next. Love it! How did you do the boxes that are holding the cupcakes? Thanks for sharing such a great idea! They look sensational! Beautiful! Amazing design to construct these. I love that scalloped edge. So pretty! The color is great! Those are adorable!! And LOVE the color choice! 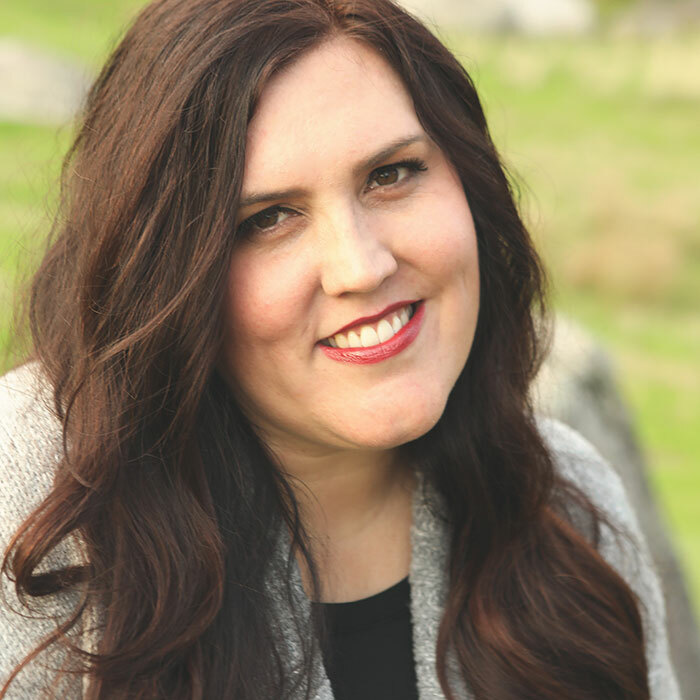 So I just spent an hour reading your blog…no joke…and I've decided that you two have made my list of top 10 people I'd like to be best friends with (along with Ree Drummond and Martha). Can I just follow you all day, every day so you can teach all your secrets to being talented and amazing at everything? These are great! I love the color. They look so elegant! So, so pretty! I love that shade of turquoise! Looks like Tiffany blue! Love it! So darling! Love the blue. Hey ash I want to see some pictures of the rest of the place?? But i must say i might come to you when my daughters are getting married. Oh wait if i ever have any daughters. Loving these! What a great idea! These are wonderful. The scallop was such a great touch and the color is beautiful! These are so fun, and multi functional. I was thinking that when they don't have cake on them, they could be filled with nuts, fruit, or other goodies from the kitchen. OH MY FREAKING AMAZINGNESS!! I'M NOT WORTHY I'M NOT WORTHY! !Dang I sure wish I had the mad skillz you ladies do!!!! AHHHHHH MAZEEEE INGGGGGGGGGGGGGGGGGGG!!!!!!!!!!!! Very cute. 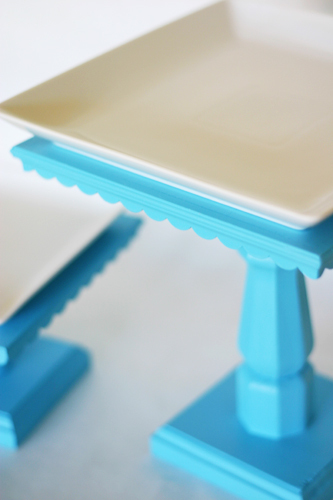 Of course, I am a bit obsessed with cake stands and this just adds to the list of "must haves," so I am sure there are "some" people in my house who will not be pleased that I stumbled upon your post! Those are awesome! 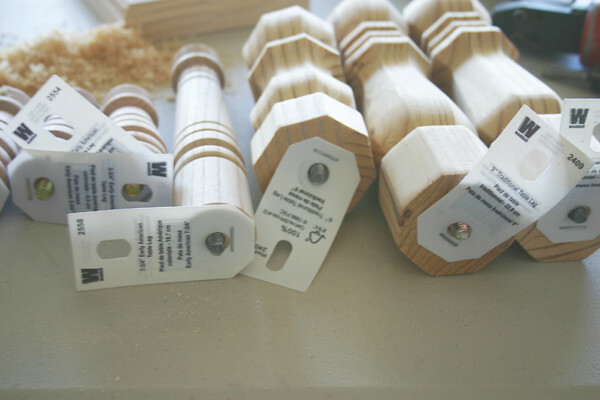 Great idea to put them together yourself…and be able to take them apart again. I'm excited to make some of my own. I love this idea. I totally have a cake stand fetish, but sadly I only own one because of the storage issue. Making them collapsable is genius. I absolutely adore those stands! I might have to make some! I'm your newest follower! Found you through Be Different, Act Normal! OH how I LOVE these. I so plan to make some, sometime anyway. I came from Be Different. Now I am going to hang around and see all the other marvelous things you do. dude, you totally had me at "turquoise"! Lovely stuff! I love how creative this all is! Would you be willing to sell/rent these bottles and things to me for my sister's wedding? Let me know! OH.MY.GOSH. You are a cake stand genius! Thank you so much for sharing this project – I just love it! I am featuring you on my blog tomorrow (this post) and will link back and credit to you. Please let me know if that is a problem in any way. Would you mind sharing the paint color? I just love these, especially the color! I've been searching everywhere for that exact shade. Hi Kelsey! 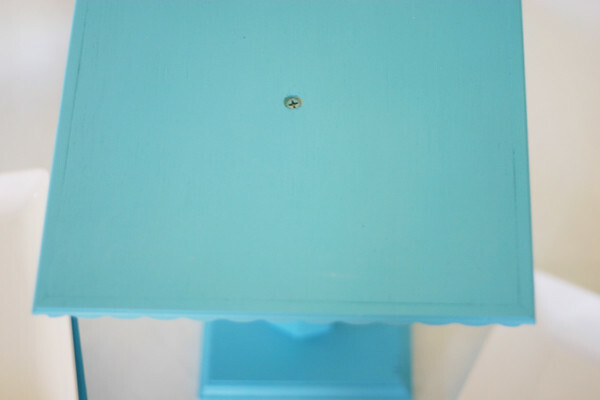 I originally spray-painted with Rustoleum (aqua, I think). But then I repainted with a "Smart Craft" brand of acrylic paint. The color is called "pool." The second color was really close, but a tiny bit brighter and more blue. If you can't find this brand though, the Rustoleum spray paint is really close. 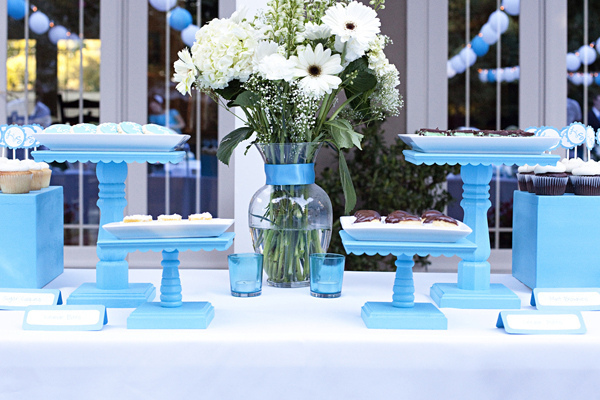 Those are seriously the cutest cake stands ever! I'm so going to have to make these. Thanks so much for sharing! Those are great. Love the color, and the simplicity!! Really good instructions for these cake stands! Must have been an awfull lot of work, but the results are astonishing! Really love your work! I am in Love I am going to home depot in the morning to make these for a babyshower I am throwing this week. Can I ask where you bought your dishes? That would be a huge help! My email is jjscove@hotmail.com thanks a million! You have so many AMAZING ideas! Found you at "be different, act normal" and I am so glad I did! I can hardly tear myself away to get something done today!! These are too adorable! I can't wait to make a few! I heart stands!!! THIS IS SOOOO AWESOME! i can't wait to make my own! thank you so much for sharing! Love this! The scallop trim really makes it. Never would have thought to look at Michaels for it! Very nice! I love it and i think I can make them myself. Thanks for sharing. I posted this on my blog w a link to yours. Thanks!! 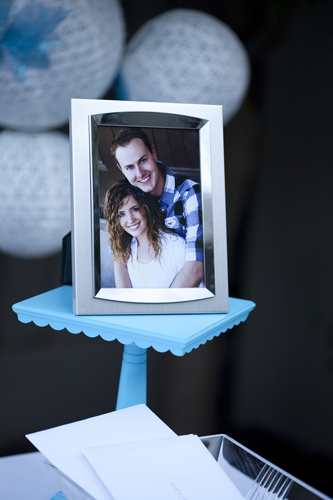 I love your cake stands…super cute! 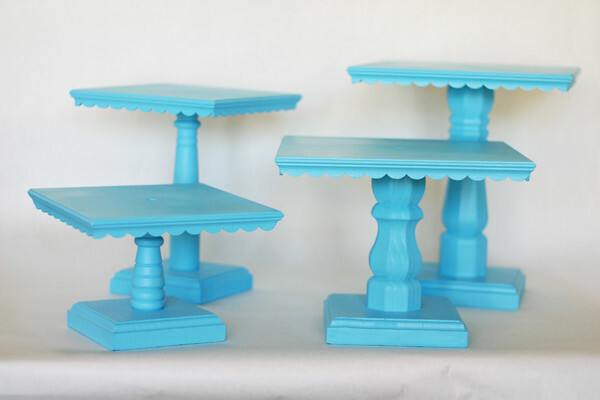 I am showing off your darling cake stands on my blog this week- left a link so my blogging gals could find you- Hope this is ok- If not just let me know and I will take it off. This is so simple, and so genius! I wish I had the wood working tools to make some! Pure Joy Events is hosting a Party Tutorial contest. Link up your tutorial at http://www.purejoyeventsblog.com/2011/03/party-tutorial-contest.html for a chance to win some fabulous prizes. WOW! Those came out super cute! 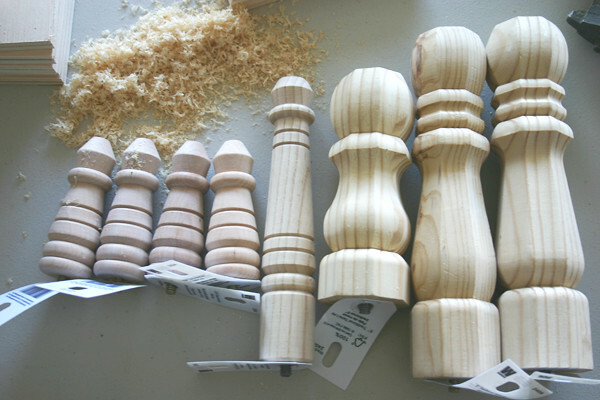 I would love to make some for my buffet. I would also LOVE to link to your how-to if you didn't mind. HOLY COW! I loooooooove these! Love, love, love! oh my goodness I love these! they're awsome! Cute idea! I also love pedestals and would love to have a bunch. I am wondering if there is a way to make them easier to store all together. I guess you could just unscrew them to store. Wow, I could not love these anymore!! This is fabulous!! Absolutely a new follower! Hope you get to come check me out sometime too! Gosh, this is great! Thank you for sharing! Could you give us the dia.? 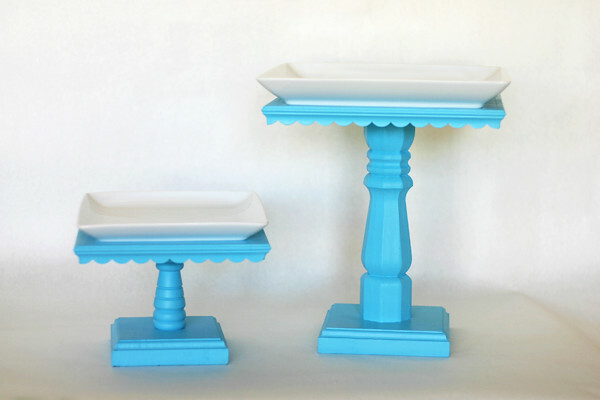 Your post was sent from someone on high…today I was cleaning out the garage and found some awesome ceramic candle stick bases and decided to use them for a base for pedestal cake plates. This post is fantastic…it sends me right on my way! Thanks so much!! I know you already had the plates. but Where did you get them? what type of paint did you use? Could you share the dimensions you used for the base and top? These are great, so when I wanted to pin it, it would not let me pin a pic. Why is that? I am guessing it has something to do with people stealing ideas and claiming it as theirs. Is there a way to pin a picture. I really want to be able to come back to the post and try to do this. Thanks. This is a very important issue and this slide is very helpful. I would mention that many of us readers actually are definitely blessed to live in a fantastic website with very many special professionals with beneficial points. Love these but could you give me the size of the base? Also, where did you find the furniture legs, would Michaels have them? This type of cake stands are really rare. I'm glad to see your creation ! Thanks so much for posting a lot of this awesome content! Looking forward to checking out more. Your post are really very nice. And the 1st image are awesome. Our photo masking are doing the image related work.